Ever since I moved back to the Pacific Northwest in July last year, I’ve been itching to start taking some Epic Transit Journeys again. Earlier this month on Sunday, January 6th, I finally decided to go on one. Located about 30 miles east of Spokane lies the city of Coeur d’Alene, Idaho. The city is more well known as a summer resort town, as it lies right on the shores of majestic Lake Coeur d’Alene, but it is also popular with winter tourists who come to visit one of the ski resorts in the area. While I like to ski, I had other reasons to visit Coeur d’Alene, or CDA as many locals refer to it as. First and foremost, I wanted to check out the local transit system, called Citylink. I also planned to check out the downtown CDA and see the sights there, along with enjoying the tastes at a highly popular eatery in town. Anything else that I happened to find would just be a fun surprise. I was also a bit excited about the fact that my transportation costs would be costing me absolutely nothing, a first for the Epic Transit Journey series. To get to CDA, there aren’t many non-car alternatives. Though both Spokane and CDA have their own transit systems, there is no public transportation route linking the two cities. However, it should be noted that the MPO’s in both metros recognize the lack of that link as a major need to address. There is intercity bus service operated by Greyhound and Northwestern Trailways that connect the two cities. However, with the starting ticket price being about $14.50 one-way, this is a highly impractical option that very few, if any, would want to rely on. There is only one option to bridge the gap between the two cities, and that option is a another first for the Epic Transit Journey series: A casino shuttle. About 25 miles south of CDA on the tribal lands of the Coeur d’Alene Tribe is the Coeur d’Alene Casino. Open since 1993, the casino is a popular destination for many in the region, a large number of whom come from the Spokane area. Recognizing this, the casino operates two shuttle routes which provide a free ride from Spokane or Spokane Valley direct to the casino. I’m sure the thinking behind it is that if they can get their customers to save money on gas, they’ll spend more at the casino. As you have to be 18 or older to gamble, the shuttle service is also restricted to those of gambling age. The problem with using a casino shuttle to get to CDA was finding a way to one of the shuttle stops. On the Spokane route, there are only three stops: Albertson’s on Francis, Yokes on North Foothills, and the old Albertson’s on Northwest. As the Yokes stop was the closest to my residence, that was the one I planned to board at, but I was still left with a 3+ mile walk. I could have used STA to get from my residence to the Yokes stop, but in the interest of keeping my transportation costs at $0, I declined to do that. The casino shuttle was scheduled to be at Yokes at 9:05AM, so I ended up setting my alarm for 6:30AM. The walk to the Yokes stop was mostly uneventful, as it was a Sunday morning and the streets were basically empty. Some fresh snow had fallen over the previous night, so it was nice to enjoy being the first person to walk through it. After arriving at Yokes a bit earlier than I’d planned and wandering around the store for a while, the shuttle showed up right on time at 9:05AM. Apart from myself, there were 4 other people boarding, one of whom was a tribal employee. Already on the shuttle were 4 other passengers, though 2 of them alighted when we arrived at former Albertson’s stop. Along the way, we also picked up another passenger at the gas station in Rockford, which is a flag stop on the shuttle routes but not listed on the schedule. 38 miles and about 70 minutes later, we pulled in to the casino a bit ahead of schedule. With more than 50 minutes to wait for my next bus, there wasn’t much for me to do but sit around and wait around. I did wander around the casino a little bit, but the loud slot machines and smell of everyone smoking cigarettes is hardly my scene. The bus I would be boarding arrived at the casino at 10:33AM with about 20 passengers before pulling away for a scheduled layover. Around 11:05AM, the bus I was waiting on pulled back around to the bus stop at the main casino entrance and started boarding passengers. 4.5 hours into my day, I was now going to get my first experience with Citylink. 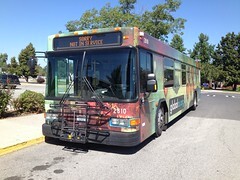 The bus we were boarding was on the Link Route, which runs between the Coeur d’Alene Casino and Riverstone Transit Center, which is located in the Riverstone development of CDA. Along with myself, 11 other people boarded the bus before we left the casino. As the bus had 29 seats, there was plenty of room for everyone. Leaving right on time at 11:08AM, we started heading north along US Highway 95 towards CDA. Along the way, we stopped in Fighting Creek to pick up a passenger. Along with Mica Grange, the bus will not normally stop in these two communities unless a passenger calls to request it. To my knowledge this one of the only, if not the only, example of route-deviated service in Idaho. After turning off US Highway 95 and passing through the west end of CDA and stopping at major employment center Kootenai Medical Center to picking up a few passengers, we reached Riverstone Transit Center at 11:45AM. Though Citylink has been operating since November 2005, there still has not been a permanent transit center built anywhere in Metro CDA. Instead, Citylink operates a hub out of an unpaved parking lot in the north end of the Riverstone development. When operations first began, the hub was located next to the parking garage by Regal Cinemas, but as development of the Village at Riverstone progressed, the area became too congested. Instead, Riverstone developer John Stone let Citylink use a vacant lot in the development at the corner of Seltice Way and Riverstone Drive. Though Citylink has been able to use the space for free for several years, they were asked in August last year to start paying a lease on the property costing just over $20,000 per year. Apart from a passenger shelter, some garbage cans, and a couple port-a-potties, minimal investment has been made to the facility. Citylink had planned to only use the Riverstone lot on a temporary basis until they could develop plans for and built a permanent transit center somewhere. The latest reports suggest that Citylink plans on constructing a permanent transit center at the same location where buses currently connect. I certainly hope it is soon, because a dirt lot is hardly an ideal place for a transit hub. After mulling around Riverstone Transit Center for a while and taking pictures of the buses (which concerned one of the operators a bit until I explained what I was doing), I boarded the C Route. Also referred to as the Green Route, it serves CDA and Hayden. The route is a rather long loop, which alternates in direction every hour (counter-clockwise, then clockwise, etc), taking about 49-52 minutes to run end to end depending on the direction. The trip I was on was a “Light Green” run, which meant that the route would be running the clockwise loop, heading north to Hayden first, then south to CDA, then west to Riverstone. Along the route, the operator did ADA call outs for every single stop along the way. I was glad he did this, because even though each stop was shown on the route map, it was hard to keep track of my whereabouts while traveling along roads I’d never seen. As is typical with most nearly any other metro in the US, the further we got from downtown CDA, the more suburban the area became. Cookie cutter houses, strip malls, and big box chain stores, it was all there. But, this is also where people live and work, so this was also where the bus needed to go. Though I have no plans to move anytime soon, I made a mental note about where I wouldn’t want to live were I to move to CDA. 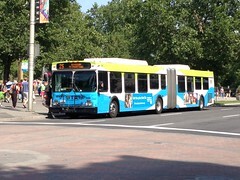 The ride on the C Route was largely uneventful, apart from the operator spinning the wheels a bit on Pinegrove Drive. About 35 minutes after the bus had left Riverstone Transit Center, I alighted at Harrison Ave and 3rd Street, ready to do some walking. North of Downtown CDA, the main arterial is the 3rd/4th Street couplet. A few years ago, CDA undertook a street beautification project on 4th Street between Lakeside Ave and Harrison Ave. Mainly the project entailed the widening of sidewalks and the addition of some street art, but from the pictures I’ve seen it is a major improvement. The only problem with 4th Street is the previously mentioned couplet. As one of two major north-south corridors between Downtown CDA and I-90 to the north, the 3rd/4th Street couplet does handle a large amount of traffic, so to facilitate the movement of cars CDA made 3rd and 4th Streets one-way (3rd south and 4th north). As many cities are discovering, one-way streets severely impact the economies of downtown districts. I think CDA is aware of this and is working towards a change in this. Perhaps my favorite part about 4th Street though were the bus shelters. Apart from a shelter at the Kootenai Medical Center, there are no other shelters to be found in the Citylink system (though there may be some on the Rural Route, which I did not ride). The shelters stand out a bit more than normal designs, which I’m a big fan of. They give passengers a sense of invitation, and fit in quite well with the general surroundings. I’m also pleased that they chose red for the paint color, which helps increase their visibility, particularly in the white of winter. Something I’d been very excited to check out while in CDA was the Northern Pacific Depot. Sadly, I’ve had an extremely hard time finding any info about the building online, so I can’t rattle off a bunch of stats about it. From what I tell, the building is still original, though the interior has been extensively remodeled. Last occupied by a Mexican restaurant, the building is undergoing renovation to become the offices for a mining company. In the past when in was still in use as a passenger train station, it was the end-of-line station for a spur line that broke away from the NP’s main line. Again, there’s little information to be found about this on the internet, but I would speculate that most service came from Spokane and other points west. It is also possible that this station was used by the Spokane and Inland Empire Railroad for their interurban line between CDA and Spokane, which ran until July 1940. After taking this trip, I was told by Zach Shaner (a CDA native) that the old railroad tracks can be seen at present in the parking lot at the rear of the station. When I was there, I had no way to check on that as the parking lot was covered in snow. After wandering around downtown for a while longer and taking a short walk on Tubbs Hill, I headed east of downtown along Sherman Ave. Several blocks east of downtown was my next destination, the Moon Time. For yet another first in the Epic Transit Journey series, I planned to indulge in the local culinary and enjoy some beer while at it. Based on the many acclaiming reviews online and the recommendation of Zach Shaner, I figured the Moon Time was the best place to do it.It just so happens that the owners also run my favorite place to eat in Spokane, The Elk, so I had pretty high expectations for the Moon Time. As I sit here and type this while my mouth salivates at the thought of my meal, I can definitely say that they did not disappoint. Ordering the namesake dish, “The Moon Burger,” and an Apricot Ale brewed by Pyramid Breweries (Seattle), I was left satisfied and full. Since this is a transit blog, that’s all the gushing all do about my experience at the Moon Time, but I will just finish by saying that it’s worth a visit if you’re ever in CDA. Walking back to Downtown along Sherman Ave at a very leisurely stroll, I wandered around Downtown some more to kill the time away before the next bus to Riverstone arrived. Since Citylink revised their schedules to have the Blue and Green Routes alternate loop direction every other hour, it had left some odd discrepancies in bus frequency. If you’re waiting for a bus in Downtown CDA (with no concern for the loop direction), you can wait for as little 20 minutes or as much as 100 minutes. I’d left myself in the middle of a 100 minute gap, hence my leisurely stroll. Apart from the odd gap in time between buses, my main issue was finding a stop. As I mentioned earlier, Citylink shows all the stops on the route maps. If you look at the route map for the C Route, you’ll notice that bus stops in Downtown CDA are a bit of a rarity. Standing right in the middle of Downtown CDA, I had two choices for where I wanted to board the bus. I could walk 4 blocks up 3rd Street to the corner of Wallace Ave, or I could head to the western edge of Downtown and catch it at 1st Street and Lakeside Ave. I chose the first option, mainly because it would get me on the bus several minutes sooner. In retrospect, my first hand experience of Citylink’s odd stop spacing is probably the biggest fault of the agency. Before taking the Link Route back down to the casino, I took a ride along the B Route, or Blue Route, to Post Falls. I also spent some time wandering around the Riverstone development. After a ride down to the casino and waiting for almost an hour, I took the casino shuttle back to Spokane and called it a night. While I certainly enjoyed my visit to Coeur d’Alene, I don’t recommend that other people attempt this Epic Transit Journey. 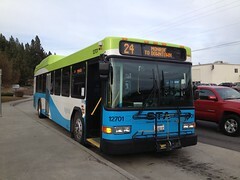 Until there is a public transit route linking Spokane and CDA, a ride on the casino shuttle and Citylink’s Link Route is the only way to make that connection. Using the casino shuttle and Link Route, one must travel more than 66 miles to bridge the gap between two cities that only lie about 32 miles apart. It’s also highly uncompetitive with the car, as the fastest possible trip between Spokane and CDA is still 1 hours and 55 minutes in each direction, but the average trip ranges more around 2 hours and 30 minutes. Using the STA and Citylink bus routes, it is possible to avoid the casino all together, but you would still be left with a gap of 7.8 miles, which you could walk in just over 2.5 hours or bike in about 40 minutes. If you’re frugal and time is no matter, then by all means feel free to give this trip a try. For my part, I don’t think I’ll be doing this Epic Transit Journey again.